Colts defensive end Robert Mathis has announced that he will retire after the 2016 season. That means Sunday’s contest against the Jaguars will be his final NFL game. Mathis, 35, has spent his entire career with the Colts since being selected in the fifth round of the 2003 draft. Across his 14 years (13 seasons) with the Colts, Mathis earned five Pro Bowl nods and one First-Team All-Pro selection. The defensive end will go down as an all-time Colts great, particularly for the first ten years of his career in which he averaged 10.0 sacks per season. In 2013, Mathis led the entire NFL with 19.5 sacks. Mathis has four sacks and 17 total tackles in 13 games played this season. He also has two forced fumbles and one fumble recovered for a touchdown. The advanced metrics indicate that Mathis has lost a step or three and that this is probably a good time for him to step away from the game. Pro Football Focus ranks Mathis as one of the ten worst qualified edge defenders in the NFL this season. We here at Pro Football Rumors wish No. 98 nothing but the best in retirement. Like Boldin, A.J. Hawk is another veteran that remains unsigned, but he tells Jim Owcazrski of the Cincinnati Enquirer that he’s staying in shape and hoping for an interested team to contact him later in the summer. While he allowed that such a phone call might not come until late in camp or even after the start of the regular season (when veteran salaries are no longer guaranteed), Hawk maintained that he has not yet set a timetable for retirement. The Chargers‘ decision on whether or not to stay in San Diego could percolate through the end of the 2016 regular season, sources tell Jason Cole of Bleacher Report (video link), who outlines some of the potential legal challenges that could stifle the team’s options. The decision can’t wait for too long, as the Chargers’ to move to Los Angeles expires on January 15, 2017. ESPN.com’s NFL writers each listed a veteran who could be on the roster bubble, and some surprising names made the list, including Barkevious Mingo, Justin Hunter, Marquess Wilson, and Matt Elam. The Raiders signing of Aldon Smith isn’t an indication that the linebacker will avoid punishment for his arrest in August, writes Mike Florio of ProFootballTalk.com. According to the writer, the NFL is currently “reviewing Smith’s case under the substance-abuse policy,” with the DUI charge being the main focus. While he could be considered a repeat offender, Florio notes that the vandalism and hit-and-run charges “won’t create any significant problems” since they don’t involve violence against another person. The issue surrounding Smith could be the potential violation of his treatment plan stemming from his previous substance-abuse punishment. If the linebacker is in Stage 3 of the program, Florio says he could be subject to a one-year suspension. Florio reports that the NFL is currently reviewing how revenue would be lost by reducing the preseason by “as many” as two games. If the schedule is cut down, the NFL would look to recover their lost money via an extended regular season or expanded playoffs. ESPN’s Field Yates passes along a pair of roster bonuses that were earned today (via Twitter): Colts linebacker Robert Mathis ($1MM) and Rams wideout Kenny Britt ($500K). The Patriots asked for the league to reinstate their two suspended staffers, and NFL.com’s Ian Rapoport says that Troy Vincent, the league’s Executive VP of Football Operations, has formally requested to meet with the duo prior to any decision. Equipment staffer John Jastremski and locker room attendant Jim McNally were suspended indefinitely in May following the release of the Wells Report. After releasing longtime backfield weapon Fred Jackson earlier this week, the Bills could find themselves without his replacement, LeSean McCoy, for their Week 1 matchup with Indianapolis on Sept. 13. McCoy, the Bills’ big-ticket offseason acquisition, has been dealing with a hamstring injury since last month and was noncommittal about his status for the opener when asked by reporters Friday. Bills head coach Rex Ryan stated he’s “optimistic” McCoy will be ready for Week 1. If McCoy can’t go, Ryan isn’t ready to name a starter for the Indy game. “I’m not gonna get into those type of scenarios, the what-ifs and all that type of stuff. I know one thing: This football team will be ready. Period,” he said. Buffalo’s Week 1 opponent, the Colts, could have pass rusher Robert Mathis back for the opener, according to head coach Chuck Pagano. “There’s a possibility,” Pagano said, per Mike Wells of ESPN.com. “We’ll just evaluate how the week goes. Rob is doing great. He’s making great progress.” Mathis, who had an NFL-high 19.5 sacks in 2013, sat out all of last season after tearing his Achilles. Browns general manager Ray Farmer is suspended four weeks for violating league rules prohibiting certain uses of electronic devices during games last year. Thus, executive chief of staff Bill Kuharich will oversee their player personnel department until Farmer returns, reports Andrew Gribble of the team’s website. The Titans’ starting offensive line is in place, writes Jim Wyatt of TitansOnline.com. “Pretty much, it’s set,” said head coach Ken Whisenhunt. From left tackle to right tackle, they’ll go with Taylor Lewan, Byron Bell, Brian Schwenke, Chance Warmack and Jeremiah Poutasi. The Raiders are receiving interest from teams regarding receiver Seth Roberts, tweets ESPN’s Adam Caplan. Roberts, who signed with the Raiders as an undrafted free agent out of West Alabama last year, was second in receiving yards (243) during the preseason. Broncos defensive lineman Antonio Smith missed voluntary offseason workouts because of an ongoing investigation into criminal abuse allegations against him in Texas. However, he could be with the Broncos when veterans report to their training camp Thursday, Nicki Jhabvala and Troy Renck of the Denver Post report. The 10-year veteran spent last season with AFC West rival Oakland, racking up three sacks (giving him 44.5 for his career), before signing with Denver as a free agent. Kansas City’s Justin Houston signed the richest deal ever for a linebacker earlier this month (six years, $101.5MM with $52.5MM guaranteed), which sets the bar for the Broncos’ Von Miller‘s next contract, writes Jhabvala. “I guarantee you Von thinks he deserves Justin Houston money,” Joel Corry of CBS Sports, an ex-agent, told Jhabvala. By career sack total alone, Miller has a case: He has 49 in four seasons, while Houston has 48.5 in the same amount of years. It’s always risky to expect big things from a player returning from a torn Achilles’, which Colts pass rusher Robert Mathis is doing this season, but head coach Chuck Pagano has high hopes for the 34-year-old linebacker. “He will make a huge impact this season,” Pagano said, according to ESPN’s Ed Werder (via Twitter). Mathis missed all of last season after leading the league in sacks with 19.5 in 2013. In other Colts news, Kevin Bowen of the team’s official website wrote of the concerns centering on the club’s offensive line as the season nears. Indy needs a major bounce-back season from veteran right tackle Gosder Cherilus, who struggled with injuries and poor play last year, and for newly signed Todd Herremans to be the answer at right guard. Running back Latavius Murray was one of the Raiders’ few standouts last season, rushing for 424 yards on 82 attempts (a sterling 5.2 per-carry average) during his first year of action. Oakland is counting on him to be its No. 1 back this season, writes Scott Bair of CSNBayArea.com. That would mean a significant increase in workload for the 2013 sixth-round pick. After taking a look at a few Thursday headlines out of the NFC this morning, we’ll shift our attention to the league’s other conference and check in on the latest from around the AFC…. Earlier this week, Albert Breer of the NFL Network reported that Jon Gruden is a big fan of quarterback Derek Carr and that his presence could help lure Chucky back to Oakland. Now, Mike Florio of Pro Football Talk hears that Raiders owner Mark Davis actually drafted Carr in the second round of this year’s draft as a part of his plan to bring Gruden back. As Stephen Holder of the Indianapolis Star explains, the extra non-guaranteed year tacked onto the end of Robert Mathis‘ current contract isn’t the reason the Colts extended his deal. The extension included a reworking of his 2015 salary that makes it much more palatable for the team to move on from the veteran pass rusher after this season, if he’s viewed as too expensive or if he isn’t recovering well from his torn Achilles. Asked earlier today about head coach Rex Ryan‘s job security, Jets owner Woody Johnson said that’s something the team would evaluate at season’s end. For his part, Ryan told reporters today, “I think we’ll win this year. … I believe in my heart that I’ll be a part of [the Jets’] long-term future” (Twitter link via Manish Mehta of the New York Daily News). News that Justin Blackmon has voluntarily entered a treatment facility is a good sign that the troubled receiver may finally be turning his life around, writes Michael DiRocco of ESPN.com. In fact, that should make the Jaguars cautiously optimistic that the wideout may return to the field one day. Blackmon is currently serving an indefinite suspension for his third violation of the NFL’s substance abuse program. As speculation swirls around the idea of Jon Gruden reuniting with the Raiders, the Monday Night Football analyst did his best to quell that talk in an appearance on ESPN Radio’s Mike & Mike today, as Dan Hanzus of NFL.com writes. Meanwhile, it’s not a certainty that GM Reggie McKenzie will be the person to make the next coaching hire. McKenzie himself acknowledges that he’s on the hot seat. “I work every day like my job is on the line. That’s just the way I am. No one has to tell me my job is on the line. No one,” McKenzie said, according to Scott Bair of CSNBayArea.com. 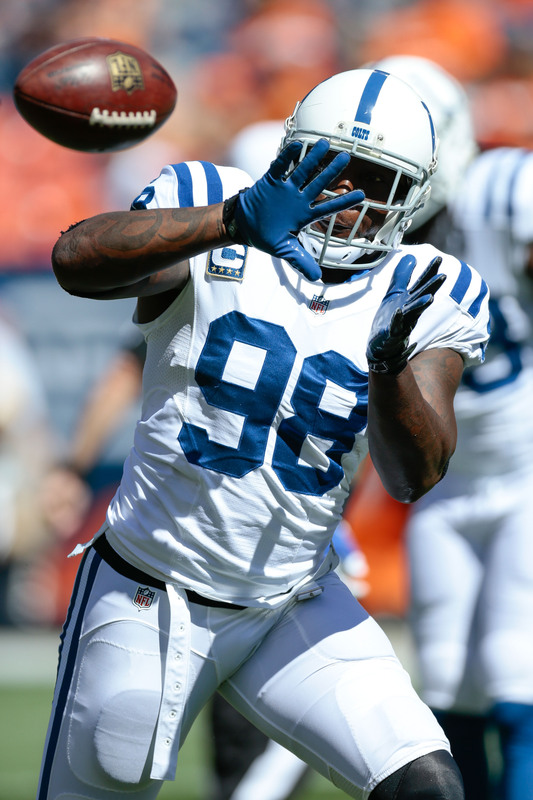 Here’s more out of the AFC..
Mike Wells and Field Yates of ESPN.com provide a breakdown of the one-year extension Robert Mathis signed with the Colts. The 2016 year includes a $1.5MM roster bonus on the fifth day of the league year, a $3.5MM base salary, and escalators worth up to $1MM depending on how many sacks he totals in ’16. Interestingly, Mathis’ 2015 roster bonus, worth $3MM, has been changed to $3MM in per-game roster bonuses. Because the veteran pass rusher won’t play in 2014, that should remove that bonus money from the Colts’ 2015 cap for the time being. Browns wideout Josh Gordon, who has six games remaining on his suspension, spoke to Elizabeth Merrill of ESPN The Magazine about his suspension, and denied that he has a drug problem. “Definitely not,” Gordon said. “I wouldn’t know what I was addicted to because I don’t do anything.” According to Gordon, who believes he was already in stage two of the drug program when he entered the league, he has taken roughly 180 drug tests since being drafted in 2012. With the Jets still seeking consistent play from their cornerbacks this season, head coach Rex Ryan acknowledged today that the club had interest in signing Brandon Flowers this past offseason before he landed in San Diego (Twitter link via Brian Costello of the New York Post). While many of the notable free agents signed by the Jaguars in the spring haven’t impressed much during their first season with the team, Hays Carlyon of the Florida Times-Union points out that Jacksonville can easily move on from just about all of those players without having to carry much dead money next year or beyond. The Colts announced a series of roster moves today, including the signings of one player to the 53-man roster and a pair of players to the practice squad. However, the most notable of the team’s Tuesday transactions is a contract extension for edge defender and pass rusher Robert Mathis, whose deal has been extended through the 2016 season. In addition to locking up Mathis for an additional year, the Colts have also signed defensive back Jalil Brown to their active roster. The two openings on the club’s practice squad have been filled by wide receiver Chandler Jones and inside linebacker Rob Ruggiero. Mathis was reinstated from his suspension following Indianapolis’ Week 4 win over the Jaguars, but rather than being moved to the active roster, the veteran defender was placed on the reserve/non-football injury list. The 33-year-old tore his Achilles while working out away from the club, which means he wasn’t necessarily entitled to his 2014 salary. However, according to Albert Breer of the NFL Network (via Twitter), Mathis is still receiving his full ’14 salary, while the new deal tacks on a $6MM salary for 2016. As Breer explains (via Twitter), the one-year extension essentially represents a team option for 2016, with Mathis doing a favor for Indianapolis in exchange for receiving his salary this season. It’s not clear if the extension also reduces Mathis’ $10.75MM cap hit for 2015 at all. As for Brown, he saw action on special teams and occasionally on defense for the Chiefs in 2011 and 2012, but didn’t see the field much last season during his time with the Colts and Dolphins. No corresponding move is necessary to add Brown to the 53-man roster, since the Colts had placed Mario Harvey on injured reserve earlier this week and had an opening. The club should also have room for another addition this week, with LaRon Landry heading to the reserve/suspended list.